Hannah Mills and Eilidh McIntyre first partnered at the World Cup Series Final in Spain last month, winning gold. 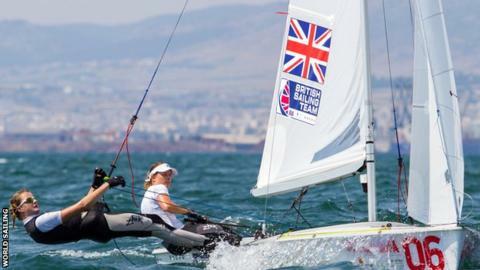 Welsh sailor Hannah Mills was disappointed she and Eilidh McIntyre could win only silver at the 470 World Championships in Greece. Poland's Agnieszka Skrzypulec and Irmina Mrozek Gliszczynska won after taking a 16 point lead into the final race in Thessaloniki. Mills and now-retired Saskia Clark won gold at the 2016 Olympics and the Welsh sailor had hoped for more in Greece. "I'm pretty disappointed actually. I went to get the gold," she said. "I've only just stepped back in the boat a month ago. "It wasn't really the ideal build-up time or anything and it's a brand new partnership with Eilidh McIntyre so it was a lot to expect, but I guess being a competitive person you always want to win. "I think once you've got a taste of winning, it's that or nothing really." Cardiff-born Mills only returned to competition in May, having experienced concussion symptoms following a training collision in January, and stomach problems in March. She partnered Winchester-born McIntyre for the first time in June as they took gold in the World Cup Series Final. Mills expects the disappointment of not winning gold to wear off as the season continues. "It's just in the aftermath you think 'what if, what if, what if', but that's life," she told BBC Radio Wales. "They (Skrzypulec and Gliszczynska) were super consistent. They put together a really, really good series of results throughout the week and we had a little dip in the middle. "You do learn an awful lot more from mistakes and what went wrong so certainly from that point of view it was good. "But results wise it then put us under a bit of pressure to try and claw back a few too many points in the last few days."